"To promote, improve, and develop the education of all individuals"
The Harvard International Relations Council is one of the oldest and largest student-run organizations at Harvard College. Our mission is simple: promoting awareness of international issues and using the resources available to us to educate ourselves and our peers, at Harvard and around the world. With an annual budget of over $950,000, the IRC inspires global leadership and presses for real world impact. Serving more than 500 members, the IRC forms an integral part of its members’ college experience, with an extensive network of alumni around the world. We are a registered 501(c)3 non-profit corporation and an accredited NGO with the United Nations Department of Public Information, and we were first incorporated in Massachusetts in 1974. Harvard Model United Nations (HMUN), one of the oldest and most prestigious high school Model UN conferences in the world. Harvard National Model United Nations (HNMUN), one of the largest and most well-respected conferences on the college Model UN circuit. Harvard Program for International Education (HPIE), a public service program for teaching international relations at schools in the Boston area. Intercollegiate Model United Nations (ICMUN), one of the most competitive and well-respected traveling teams on the college Model UN circuit. 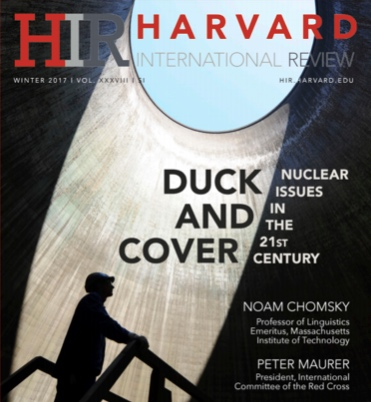 Harvard International Review (HIR), the premier undergraduate journal of international relations, with an international distribution to over 50 countries. International Relations on Campus (IRoC), our campus outreach program that fosters awareness of international issues among Harvard undergraduates. Model Security Council (MSC), our annual introductory conference for new members at Harvard.